This weekend's been the first full on weekend of koi since last autumn; I've been prepping for the spawning season and also spent an enjoyable day out at the South East Koi Club's "Sping Koi Show" with a couple of my koi club friends, Mark Hobden and Danny Emery. A day out in true Kangei Style - we popped into Koi Water Barn to see their latest koi shipment then travelled onto the Spring Show where we spent the rest of the day perusing, chatting and in my case - a bit of retail therapy at the Norfine Nets store. I picked up a new koi sock, some selection nets and a short handle pan net which will make things so much easier for catching fish in the smaller tanks. On the home front, we've been getting ready for the spawning season. 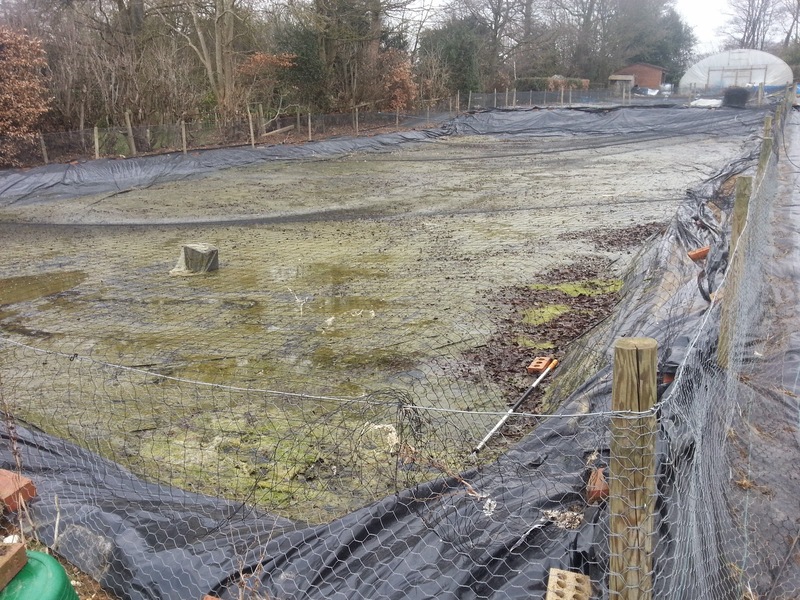 Winter maintenance on the pond this year involved weed matting all around the pond to create a 1-2m grass free zone - objective, to reduce strimming maintenance. We have a bit more to do around the polytunnel, and the muddy track leading to the polytunnel needs converting into a proper path. I drained the first fry pond while I was at the Spring Show yesterday, and headed out this morning to puncture the liner where pools of water remained. 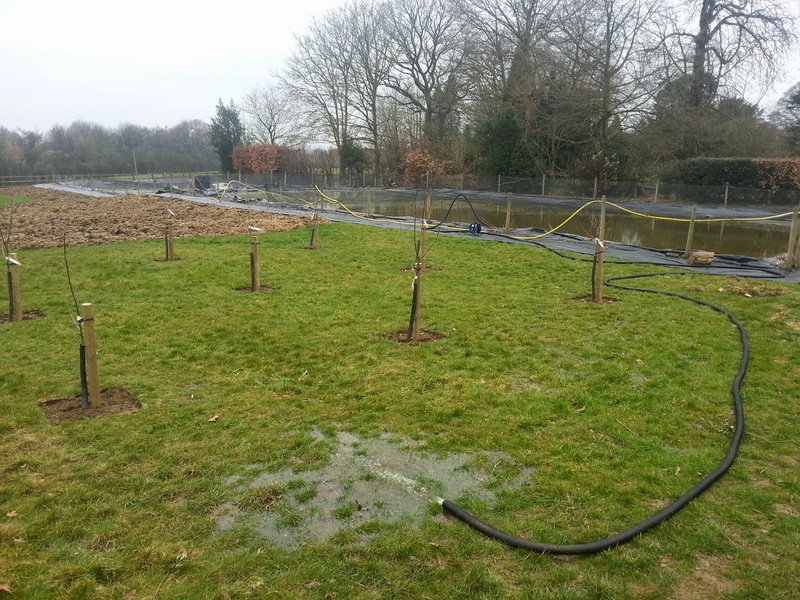 We've planted some fruit trees over the winter which are benefitting from a good watering with nutrient rich water. Once empty, Amanda and I scoured the pond for wildlife and moved frogs and newts - and cleared out twigs and other objects that might cause a puncture before we laid the new liner. I find a hoe is good for pucnturing the liner and I carry an old pari of scissors with me to extend the holes if need be. There's always some problem to deal with when laying the liners. This time - the way the liner was folded was different to normal, so our unrolling and spreading routine had to change a bit. And there was a hole in it right in the middle! Thank goodness Amanda spotted it, and I have a tube of goldseal on hand for such situations so that was dealt with quickly. The customary picture of my pond with a new liner and being filled. It's filling now, and I'll go through the same process with the other pond next weekend. Fingers crossed we get a liner with no holes in it next time. The females are still looking good and I don't remember such a seemless transition out of winter. 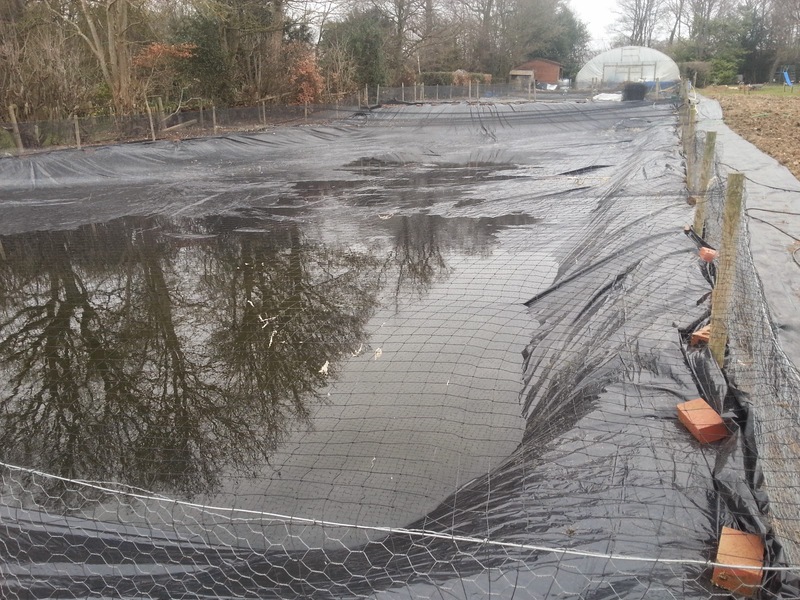 Same for the males tank, but there have been some problems to deal with on the electrics and the growing on ponds. The circuit breaker has been tripped lots of times over the last week. It's such a pain when that happens because I lose water from the tanks and in particualr, the growing on tanks lose around 1 to 2 inches of water - it's to do with the head created by the pumps and the height of the overflow outlet. The reason it's been a problem is becuase I've been treating those tanks - so not only does the flow stop when the power's off - but when I lose that much water my treatment solution %'s are also thrown off. I've been so busy with work that there's been limited time in the evenings to diagnose where the fault is , and after working out that one of my air pumps is causeing the issue - I now have a problem when my high capacity air source heat pump is on. I need to get an electrician in asap. In the mainwhile - it means I can't heat the growing on tanks sufficiently, and they're at aroung 18C. They're going through treatments anyway so fish are off their food a bit - and I'm losing around 2 weeks of good growing on time. Check out how cool this tancho looks the last time I bowled here about 3 weeks ago. Measured on 28th Feb at 38cm. Well, she's hurt herself. (I think it's a she). Aaaaagggghhh. She's taken a knock of somekind and her swimming actions is - how can I describe it - well, if you imagine a normal swimming actions is like a wave of motion flowing along the fish's body; her swimming action is more like there's a hinge aboout half way along her body and the swimming action is more of a body hinge rather than smooth wave of motion. It's like she's strained her back. 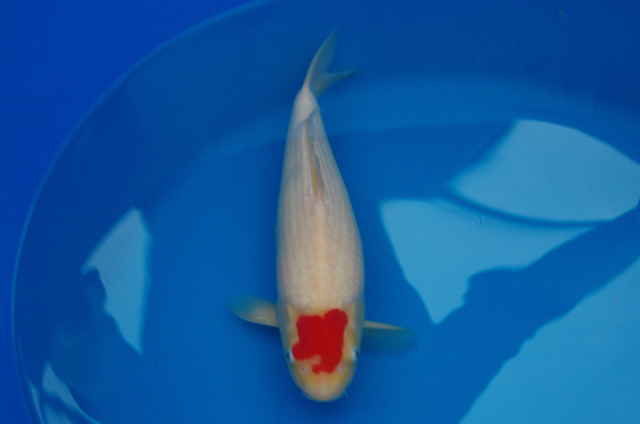 I've had this happen once before a few years ago with a fish of smilar size that I brought back from a koi show. In that situation, I thought the fish would have to be put to sleep, but I dosed high on the salt (slightly under 0.9%) and left the tank for a couple of weeks keeping a close eye on it to track its progress - and amazingly, the problem went away and it must have been a short term injury. I'm following the same treatment with my growing on tanks in the slim hope I achieve the same result my 'harrry potter' tancho. I have a question mark over her skin quality - and depending on how that pans out- I think she's a fish for the future, and if it turns out to be permanent damage, the she would be a massive loss from the 2014 spa wnings. I'll let you know how it goes. And finally, some really good news. Koi Carp magazine is a uk-based koi magazine and they run an annual awards voted for by the readers. 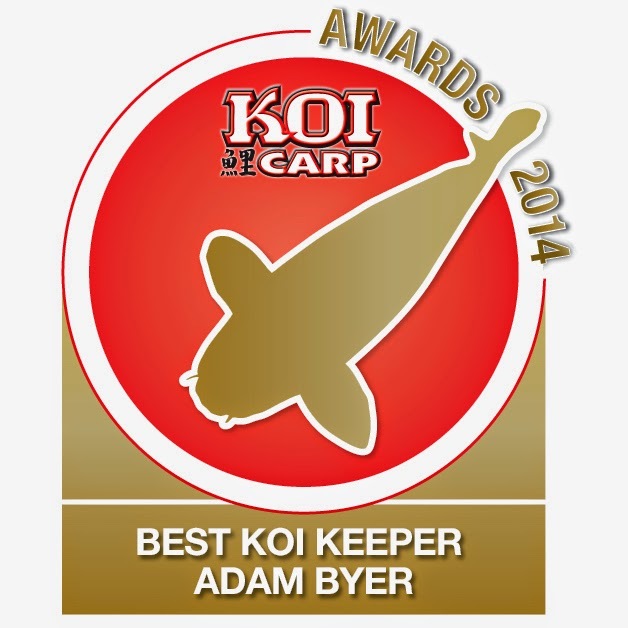 There are 10 awards, and one of them is the coveted "Koi Keeper of the Year" award. In 2013, I was pleasantly suprised to appear in the "highly commended" list. But this year , I've been voted as the winner! I'm blown away, and so pleased with the news. The votes are cast on free text voting forms - so what a massive job that must be for the magazine staff to analyse the results. It means the voting is wide open - so to appear in the list of names, let alone be voted as the winner shows that there are people out there who appreciate what I'm doing. And thank you so much for the support. And my koi club did pretty well too. It's been a privaledge to be part of the growth of Kangei Koi Club which I've been able to support as chair of the club over the last 3 years. And the club won in the recent awards taking the "Best Koi Club" award. That success was down to the whole club - the committee and members making 2014 a year of interesting and well atteneded events. It's great news for everyone involved, and Mark Hobden who was brilliant to work with as vice chair last year has taken over as chair this year and I know he has the support of the members and a new committee to continue the success. Ok, magazine and club news over - I have one or two more koi case studies to write up and please keep an eye out for my article in Koi Carp magazine. I'm not sure which edition it's going in but should be sometime soon. Ebay's going well - we have worked out how many fish we have to move on each week to free up enough space in time for the next round of selections and so far, we're on course. The money in really helps too and we appreciate the support from people who've taken fish off us. Enjoy your koi - and keep a look out for parasites..... it's the season.